A fresh denim friendly print that will look just as gorgeous with your jeans and heels or shorts and sandals. This elegant dress is the perfect balance between not too fitted and not too flared. The twist front creates flattering fullness over the bust and tummy and looks just as good post pregnancy. These linen chino maternity shorts are perfect for summer style.They are designed to fit comfortably with a light comfort roll top that can be worn up over the bump or rolled down onto your hip. 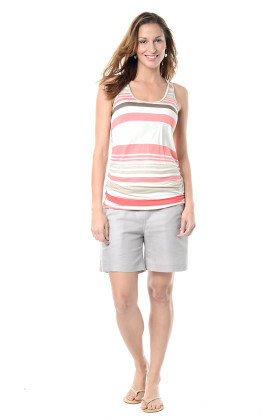 The natural fabric make these shorts cool, comfy and easy to wear with just about any top for a casual, stylish look.